The Bell 47 was the first helicopter to be certified for civil use on 8 March 1946. It was largely designed by Arthur M. Young who joined Bell Helicopter in 1941. Over 5,600 were produced up to 1974, including 1200 under license in Italy, 239 in Japan, and 239 in the UK. It entered U.S. Military service in late 1946, and would go on to service under a wide variety of versions and designations over 3 decades that followed. Its use in the Korean War (1950-1953) as the H-13 by the United States Army would be among the highlights of its extensive career. 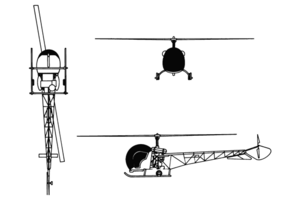 Early Bell 47 models had open cockpits or sheet metal cabins. The most common model, the 47G introduced in 1953, can be recognized by the full bubble canopy, exposed welded-tube tail boom, and saddle fuel tanks. Later 47H and 47J Ranger models had a regular cabin with full cowling and monocoque tail boom. Engines were Franklin or Lycoming horizontally-opposed piston engines of 200 to 305 HP (150 to 230 kW). Seating varied from two to four. Many are still in use as trainers and in agriculture (as of 2005). The first Bell helicopter to use a turbine engine was a modified Model 47G (designated the XH-13F or Model 201), first flown in October 1954. NASA had a number of Bell 47s during the Apollo programme, used by astronauts as a trainer for the Lunar Lander. Eugene Cernan had a near disastrous accident shortly before his flight to the moon on Apollo 17 by crashing one into the Indian River. Initially, the US Navy procured several Bell 47s, designated HTL-1, between 1947 and 1958. The US Coast Guard evaluated this model, and procured two HTL-1s for multi-mission support in the New York Harbor. The most common US Navy version of the 47 was designated the HTL-4, and dispenses with the fabric covering on the tail boom. The US Coast Guard procured three HTL-5s in 1952 (similar to the HTL-4 but powered by a Franklin 0-335-5 engine) and used these until 1960. The Coast Guard procured two of Bell's Model 47G and designated them HUL-1G in 1959. 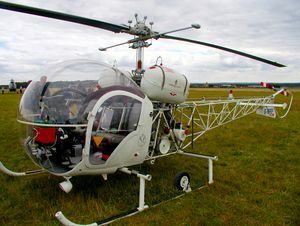 The British version of the 47G, called by the British Army the Sioux AH.1, was built by Westland Helicopters for use by the Army Air Corps, who used it until the early 1980s. The Sioux military version was often equipped with military evacuation panniers, one to each skid, with a acrylic glass shield to protect the patient from wind. H-13 were produced in Japan by a Bell and Kawaski venture;this led to the Bell-Kawasaki KH-4 variant, essentially a three seat version of the Model 47. The Bell 47 was designated under multiple systems, see United States of America military aircraft designation systems. It is best known as the H-13 Sioux, though it actually started as the YR-13 in 1946. It became the H-13 under the USAF, though the USN had called it the HTL. In 1962 Army, Navy, and Air Force versions were redesignated under the new Tri-service system. Mainly, the H-13 based ones were converted to new standards which included a vehicle type designator and a mission symbol (2 letter prefix; OH, UH, XH, etc. This was a shift from the initial USAF 1948 system (with the numbered carried over from the USAAF/C system) and the USN 1922-1962 system to the new 1962 system. The Steven F. Udvar-Hazy Center includes the H-13 which was the first helicopter to carry an American President (Dwight D. Eisenhower) as well as the Model 30 predecessor and the Bell 47. A Bell 47G is also being restored at the Alberta Aviation Museum in Edmonton, Alberta. Bell 47B equivalent to the military YR-13/HTL-1, powered by the Franklin O-335-1. Bell 47D-1 introduced in 1949, it had an open tubework tailboom reminiscent of the Bell Model 30, ship number 3, and a three-seat configuration. Bell 47G combines a 149kW Franklin engine with the three-seat configuration of the 47D-1. Bell 47G-2 Powered by the Avco Lycoming VO-435 engine. Produced under license by Westland for the UK military. Bell 47G-2A Powered by a 179kW version of the VO-435. Bell 47G-2A-1 Wider cabin, improved rotor blades and increased fuel capacity. Bell 47G-3 Powered by a supercharged 168kW Franklin 6VS-335-A. Bell 47G-3B Powered by a turbocharged 209kW Avco Lycoming TVO-435. Bell 47G-4 Three-seat helicopter powered by an Avco Lycoming VO-540 engine. Bell 47G-5 A three-seat, utility version of the U.S. Air Force's UH-13J. It was marketed as the Model 47J Ranger and powered by an Avco Lycoming VO-435 engine. A two-seat agricultural version was later known as the Ag-5. The 47G-5 was the last model to be produced by Bell. YR-13/HTL-1 28 Bell 47A helicopters procured by the U.S. Air Force for evaluation. The YR-13 was powered by a 117kW Franklin O-335-1 piston engine. 10 of the aircraft were evaluated by the U.S. Navy as trainers. YR-13A 3 YR-13 aircraft winterized for cold-weather testing in Alaska. H-13B 65 aircraft ordered in 1948 by the U.S. Army. All Army versions were later named Sioux. H-13C 15 H-13B aircraft converted to carry external stretchers in 1952. H-13D Army two-seat version with skid landing gear, stretcher carriers, and Franklin O-335-5 engine. OH-13E H-13D configuration with three-seat aircraft with dual controls. XH-13F Modified Bell 47G powered by a Continental XT51-T-3 turboshaft. The first helicopter powered by a turbine engine. OH-13G Introduced a small elevator on the tailboom. UH-13J Two Bell 47J Ranger aircraft utilizing the 179kW Lycoming VO-435 engine acquired for VIP transport of the U.S. President by the U.S. Air Force. Originally designated as H-13J. OH-13H/UH-13H Equipped with a 186kW Lycoming VO-435 engine. 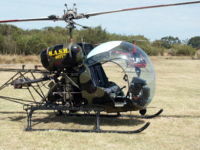 UH-13Hs were used by the U.S. Air Force. OH-13K Two converted H-13Hs with a larger diameter rotor and a 168kW Franklin 6VS-335 engine for test evaluation. TH-13L Originally designated as the Navy HTL-4. HTL-5 Utilized a Lycoming O-335-5 engine. TH-13N Two-seat, dual-control, instrument trainer with all-weather instrumentation. Originally designated as the Navy HTL-7. UH-13P Used aboard ice-breaking ships. Originally designated as the Navy HUL-1. HH-13Q Originally the HUL-1G, it was used by the U.S. Coast Guard for search and rescue. OH-13S Three-seat observation helicopter to replace the OH-13H. TH-13T Two-seat instrument trainer for the U.S. Army. El Tomcat Mk.II Bell 47G-2 modified extensively for agricultural spraying by Continental Copters Inc. First flew in April 1959. El Tomcat Mk.III Improved version of the Mk.II, it first flew in April 1965. El Tomcat Mk.IIIA Powered by the Franklin 6V4-200, 6V-335, or 6V-350 engines. El Tomcat Mk.IIIB Featured a modified fiberglass nose with a repositioned windscreen and a lower cabin roof, and was powered by the 235 hp Franklin 6V-350-A. Produced in 1967. El Tomcat Mk.IIIC Improved version with 200 hp Franklin 6V4-200-C32, 210 hp 6V-335-A, or 235 hp 6V-350-A engines. El Tomcat Mk.V First flown in June 1968, it was powered by a 220 hp Lycoming VO-435-A1A. El Tomcat Mk.V-A Powered by a 260 hp Lycoming VO-435-A1F with a foldable jump-seat. El Tomcat Mk.V-B Powered by a 265 hp Lycoming VO-435-B1A. Bell 47G in M*A*S*H paint scheme. 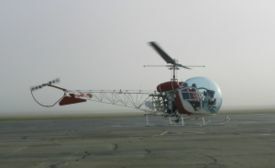 The Bell 47G was used in the 1957–1959 television series Whirlybirds, and later the movie and television series M*A*S*H. It also appeared in the Canadian TV show The Forest Rangers and the Australian TV Show Skippy the Bush Kangaroo. It was added to the permanent collection of the Museum of Modern Art of New York in 1984. ↑ Bell Helicopters. Helicopter History Site. ↑ Biography of ARTHUR MIDDLETON YOUNG. ↑ 3.0 3.1 Pearcy, Arthur (1989). A History of Coast Guard Aviation. Naval Institute Press. ISBN 0-87021-261-3. ↑ 5.0 5.1 5.2 Bell Model 47 "Sioux". Retrieved on 25 February 2007. ↑ Continental Copters "El Tomcat". Helicopter History Site. Riley, David, French Helicopter Operations in Algeria, Marine Corps Gazette, February 1958, pp. 21-26. This page was last edited on 30 July 2008, at 16:07.